Vladimir Geshkenbein is the 2011 PokerStars.net EPT Snowfest Champion after he defeated Belgium's Kevin Vandersmissen heads up. The eight handed final table took ten hours to complete and was full of action from start to finish. Morten Mortensen was the first player to be eliminated, after around 90 minutes of play, his outdrawn by the of Koen De Visscher. Half hour later and two players were busted out in quick succession. First Denis Murphy's was no good against the of Vandersmissen and shortly after Philip Meulyzer pushed the rest of his short stack into the middle with and found a caller in the shape of Vandersmissen with . Both players made a pair on the flop and Meulyzer stayed in front when the landed on the turn but Vandersmissen spiked the on the river to gift him two pair. They played five handed for almost two hours until the elimination of Cristian Dragomir. He was left with less than two big blinds when his lost to with the money going in on a flop. The turn was the but the river was the . He committed the rest of his tiny stack with and ran into the of De Visscher. Four handed play lasted for four hours then the last standing Italian player, Giacomo Maisto moved all in with on a flop and was called by Geshkenbein with The turn changed nothing but the river sent the Italian to the rail in fourth place. Koen De Visscher was eliminated half hour later, shoving 20 big bling with and not being able to outrun the of Geshkenbein. Then came the fina hand, around 15 minutes into heads up play. A raising war between Geshkenbein and Vandersmissen saw the latter all in and at risk with against of Geshkenbein. The final board ran out and it was game over for Vandersmissen, who narrowly missed out on becoming the first-ever Belgian EPT Champion. Geshkenbein's fans lifted their hero onto their shoulders and he described his victory simply as "awesome." We couldn't have put it better ourselves. So that is allfor the PokerStars.net EPT Snowfest for another year. 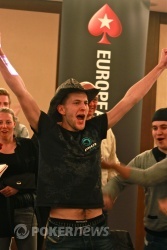 The European Poker Tour now packs up and heads off to Berlin, German between April 5-10. Join us then for the very best in live poker tournament updates. Kevin Vandsermissen has just been defeated heads-up by Vladimir Geshkenbein and is the PokerStars.net EPT Snowfest runner-up. Moments before the final hand was dealt Geshkenbain joked to Vandersmissen that he should not look so sad because "second place is a good result too." How right he was in his prediction. Geshkenbein made his standard raise to 225,000 and then in an explosion of activity there was a re-raise, an all in and a call! A huge crowd gather around the table and both players revealed their hands. 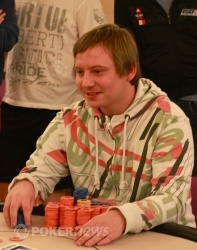 Tournament director Thomas Kremser announced the hands to the crowd and instructed the dealer to deal the flop. It came down giving Geshkenbein two pair and a huge advantage. The turn made matters more interesting as it was the but the river was not another king but the which meant Geshkenbain had won all of the 14,460,000 chips in play and the €390,000 first place prize. For the first 15 of so hands there were no flops seen and the chip counts were almost exactly even, until now. On a flop of both players checked but Geshkenbein came out betting 200,000 on the arrival of the on the turn. Vandersmissen called and the dealer put the on the river. Geshkenbein then bet 1,000,000 by moving two orange stacks, one in each hand and crashing them into each other! Vandersmissen called but mucked as soon as Geshkenbein showed for two pair. Koen De Visscher open-shoved from the small blind, but big blind Kevin Vandersmissen wasn't interested. He picked up the blinds and antes. Next hand, De Visscher shoved again, this time from the button. Again, Vandersmissen wasn;t up for it - but Vladimir Geshkenbein in the big blind was. He called, and they were on their backs. De Visscher: and sighing, "Nice hand." Although there were spirited cries of, "Ace from space!" as the cards were dealt, switching to, "Seven from heaven!" on the flop (even Geshkenbein joined in), it wasn't to be. De Visscher took his glass of champagne to the rail (Geshkenbein ordered a bottle when they went three-handed, and we are now heads up. During play yesterday Kevin Vandersmissen ran a huge bluff against Martins Adeniya and he has just made another one now they are playing three handed. Vandersmissen raised to 200,000 from the small blind and Geshkenbein called. The flop came down and Vandersmissen check-called a 330,000 bet from Geshkenbein. The turn was the and Vandersmissen bet 850,000, a bet that was quickly called. The river was the and Vandersmissen bet 1,400,000. 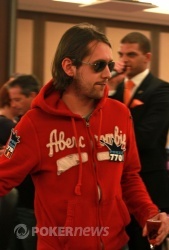 Geshkebein looked as if he was going to move all in but he failed to pull the trigger and folded saying he had ace-high. Vandersmissen turned over to show his bluff.